You will then be guided through an awareness of your body in the moment–much as you might in another form of guided meditation. 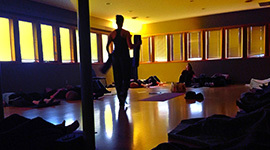 iRest Yoga Nidra has been used to help people with insomnia, PTSD, and many other issues. It can also help people feel more alert. Certainly, it is a wonderful tool for letting go of stress and living in the moment. It represents a simple yet profound way to care for ourselves, a way to create a foundation on which to thrive. This entry was posted in Yoga, Meditation and tagged meditation, guided meditation, yoga nidra, amy prais. Bookmark the permalink.